Handcrafted elevator ankle boot with upper in fine burnished light brown leather hand-buffered and natural rubber sole stitched at sight. 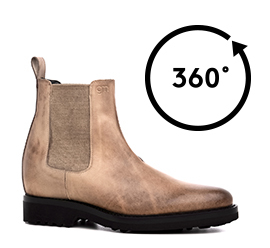 A Chelsea boot with a distinctive character enhanced by a classic design and a meticolous attention to every detail. The invisible inner elevator system is able to increase height up to 4 inches (10 cm).